Kids respond to rhyme and rhythm, done well. They are more likely to become engaged with a story that gets their fingers tapping and bodies jiggling. Strong rhyme and rhythm in a picture book helps kids memorise the whole or part of the book, an intermediate step along the road to reading. Repeated reading aloud of such a book over time is also helpful. Picture books with strong rhyme and rhythm lend themselves to performance. When children become immersed in a picture book because they are involved in practising it for performance, they learn vocabulary, internalise language structures and rhythms, and get to practise group reading. By practising rhymes and listening to them, kids are developing phonological awareness, another essential milestone on their reading journey. It’s important for children to learn to both recognise rhyme and to generate rhymes. 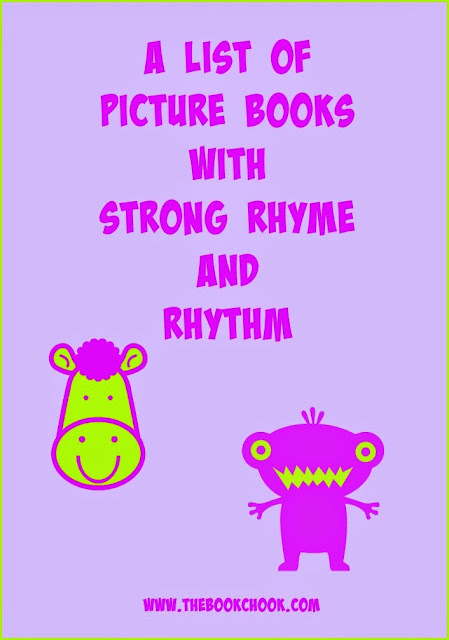 Because I run a weekly Library Storytime session for preschoolers, I'm constantly on the lookout for great children’s books with strong rhythm and rhyme. A picture book doesn’t need to have rhyme and rhythm to be great, BUT such books are one essential part of children’s reading diet. At the suggestion of teacher librarian Helen Boelens, I’ve begun compiling a list of such books. I hope the list will grow and be of help to both me and others. Again I’m using Listly to create my list. I love that Listly grabs a thumbnail to give you a visual of each list element. You can vote up any books you like, and add comments too (moderation is on.) You can also embed my list on your own blog or website. Be aware that there can be extra pages in any list, navigable via an arrow bottom right. Some books I've reviewed at The Book Chook; others have been recommended to me by adults who share my passion for children's literature, and whose opinions I respect. Some books will be represented by reviews, others by youtube videos, so you can gain an idea of the books. Thrilled to see you have Duck in a Truck, Hairy MacClary and The Going to Bed Book. Great choices! Ronna, feel free to hit the thumbs up sign on any individual books you love. And thanks for contributing to my list!